Many of us have experienced that feeling when you get a twinge and need to see a professional for some treatment! The benefits of human physiotherapy are well recognised but it’s only in recent decades that veterinary physiotherapy has come to the fore. Our cats and dogs often lead exciting lives, full of adventure and plenty of exercise, meaning that they sometimes succumb to injury. At The Insurance Emporium, we want to try and help your pets live a healthy life so we asked our pet health expert for some advice on pet physiotherapy. Some veterinarians see physiotherapy as an indispensable tool in the management and recovery of musculoskeletal conditions and injuries in cats and dogs. As such, the field has seen significant advancements since the 1990s. 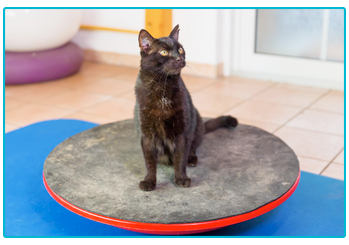 Physiotherapy is most commonly used to aid post-operative recovery of cats and dogs. It can also provide huge benefits pre-operatively and can be used to treat non-surgical conditions such as tendonitis and sprains. Whether it’s a footballer with a torn a hamstring who requires months of treatment or your beloved Labrador is suffering from arthritis, physiotherapy can be a welcome relief for humans and pets alike! Physiotherapy uses physical therapy to promote, restore and maintain physical wellbeing. It reduces pain, inflammation and scar tissue within soft tissues to improve mobility and function. Physiotherapy also strengthens and stimulates the nervous system. Pain can result in muscle tension and inactivity which, in turn, could result in reduced mobility for your animal. If your pet has an injury then it could be hard to tell how much pain they’re in. Speaking to a vet and getting a referral to a pet physiotherapist could be vital in helping to keep them happy and get fighting fit again! If in doubt, get in touch with your vet! Physiotherapy uses hands-on skills and movement such as stretching, exercise, mobilisation and massage techniques in order to release soft tissue tension. Other treatments include thermal therapy, where exposure to hot and cold is used to treat, laser and magnetic therapy and ultrasound. There are also methods that utilise electrical stimulation such as electric current and shock wave therapy. The aim of treatment can vary widely, so each programme is tailored specifically to an individual and their needs. 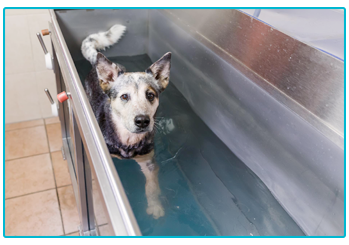 Hydrotherapy means ‘water healing’ in Greek and focuses on using whirlpools, water treadmills and pools to help treat animals. This type of therapy can help with weight loss, pre-operative conditioning and post-operative rehabilitation. The goal of the treatment is to stimulate, strengthen and relax. There could be various benefits to hydrotherapy treatment, including the promoting of balance and co-ordination, encouraging joint mobilisation though non-weight bearing exercise and the improvement of circulation and cardiovascular fitness. Hydrotherapy can also play an important role in the treatment of osteoarthritis and muscular injuries. It is frequently used as a form of controlled exercise in large young dogs and is a potentially useful form of exercise for older dogs. Whilst this type of treatment can be used for cats, it is much more common for dogs! Veterinary medicine has seen significant advancements in recent years which means that there are all kinds of treatments available! If you have a poorly pooch or a kitty in need of some care, physio and hydrotherapy could play a vital role in getting them back on their paws and out on their adventures!